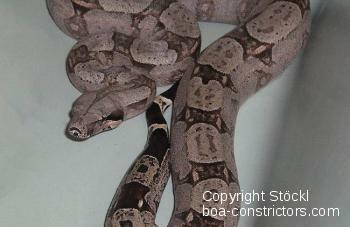 The Boa constrictor enthusiasts in the U.S. found a suitable name for the silvery gray Amaral's boas that come from the region around Sao Paolo/Brazil. They named them "Silverbacks". 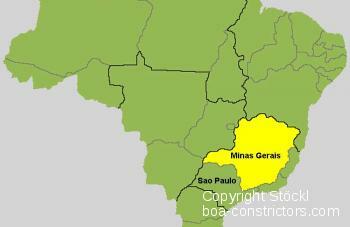 Unfortunately, many of the South Brazilian amaralis in Europe come from the "Danish bloodline". These animals tend to be delicate. A professor from Sao Paulo/Brazil was employed at the University of Copenhagen/Denmark. He brought some South Brazilian amarali to Denmark and gave them to his assistant. 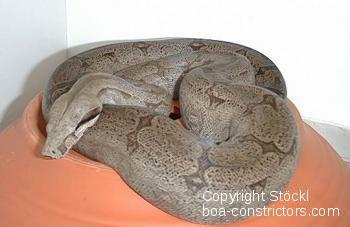 She bred them several times and made the South Brazilian amarali available in Europe. Unfortunately a significant number of the animals from this "Danish bloodline" are very delicate. Often the babies tend to regurgitate the food over and over again until they die. 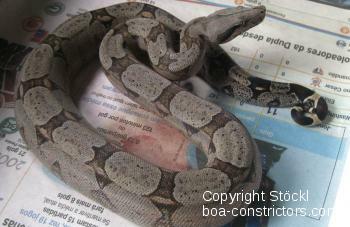 Other one´s that remained alive were raised, but later died when they got their first bacterial infection. This happend frequently after being sold. Obviously the change of the environment caused too much stress to the animals and decreased the effectiveness of the immune system. 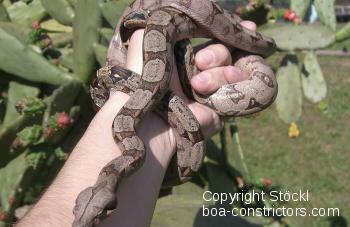 Therefore many boa enthusiasts in Europe lost their South Brazilian amaralis. This is the reason why these animals don't have a very good reputation in these parts. By the way, most of the Danish bloodline amaralis do not reach a length of more than about 5 ft.
We considered this as normal until we saw several specimens of an U.S. bloodline of Brazilian Amaralis from the Sao Paolo region. The largest of them was 7 ft. in length, mighty like a giant and robust in health. The others were very impressive as well. We have had a lot of talks and conversations with amarali keepers in the U.S. in the meantime. We now know that these animals are normally robust and healthy. 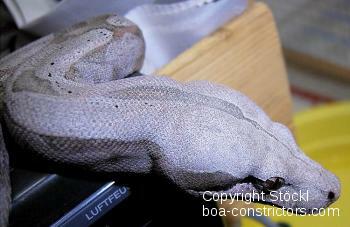 In our experience and according to feedback of other boa keepers the Danish bloodline of the South Brazilian amarali tend to be very delicate. We therefore stopped breeding them, and started a project with a new bloodline from the U.S. 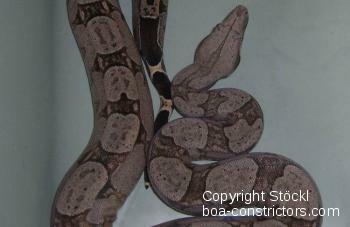 In 2001 we was successful and provided the boa enthusiasts in Europe with a healthy and robust bloodline of South Brazilian amaralis.